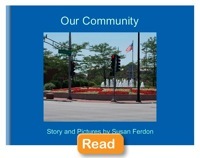 This web site is the home to the Kipling kindergarten thematic unit: Communities. Click on the links above for information and lesson materials. Through a combination of reading, writing, discussing, and creating, with an emphasis on technology integration, students will explore their community. People and places will be explored and students will have opportunities to express themselves and their understanding in writing, pictures, dictated stories, blogging with 3rd grade buddies, and Skype calls to children in other communities. Sharing and comparing will help children to build an understanding of the self, family, school, and community. The topic of communities is sufficiently wide to accomplish the Deerfleld District 109 goals for Social Studies: Learning about oneself and the relationship to others is the core of the kindergarten social studies curriculum. Develop concept of self, family, school and community. Develop an awareness of basic geographical concepts through the use of maps and globes. In addition, language arts and mathematics standards are consistently addressed throughout the unit, with music, art and PE included as well. Detailed listings of standards and benchmarks will be found in the lesson plans for each of the four topics: Exploring, People and Places, Comparing and History. In addition, a complete listing of standards that were included (some only briefly) will be found under the Teacher Resources Tab in the menu bar at the top of the page. Children make great strides both academically and developmentally in their kindergarten year. Activities within the Communities Thematic Unit are quite varied and can be omitted, simplified, or extended as suits the individual learner and curricular planning. In the Deerfield Schools, the Reading-Language Arts curriculum is organized by theme as well. This thematic unit could run concurrently, between other themes, or elements brought into Language Arts themes throughout the year. Requisite literacy skills related to comprehension and writing skills for this unit are most compatible with Reading/LA themes from January through the end of the year, particularly Small Moments VII and beyond. With the activities within the unit taught for the full day, it is estimated that the unit would be approximately two weeks long. It is recommended that activities be spread out, however, as it will allow sufficient time for students to become comfortable blogging with 3rd grade buddies, will allow time more for family involvement, and the scheduling of Skype calls easier to manage.